Our thanks to Sarah Rodeo, music director at St Francis Catholic in New Britain, Connecticut, and a member of the Ordinariate Fellowship of Connecticut, for sharing with us this information about the upcoming first Ordinariate Mass in her state. 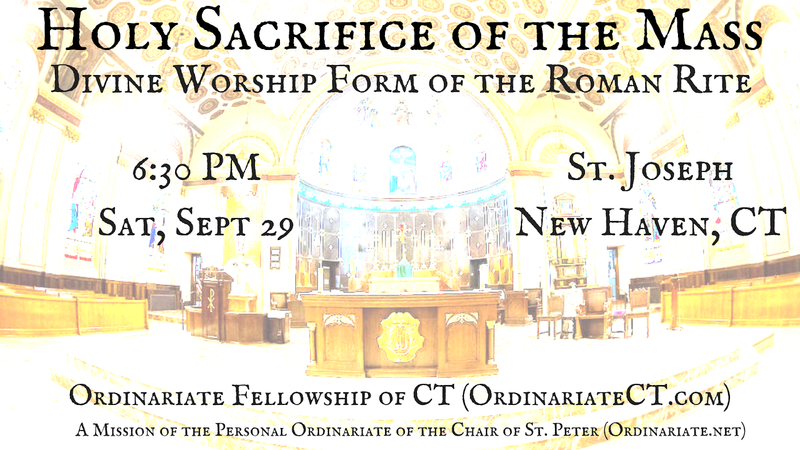 For the first time, the Divine Worship (Ordinariate) Form of the Roman Rite will be celebrated in the state of Connecticut, on Saturday, September 29th at 6:30 pm, at St Joseph’s Church in New Haven. 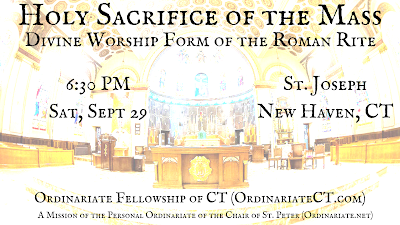 This Mass is the culmination of the efforts of the Ordinariate Fellowship of Connecticut, a group looking to form a mission of the Personal Ordinariate of the Chair of St Peter in the state of Connecticut. A professional SATB quartet and organist will sing and play William Byrd’s Mass for Four Voices (Kyrie, Gloria, Sanctus and Agnus), and his Ave Verum Corpus as a communion motet; four traditional English hymns (processional, offertory, communion and recessional - all verses will be sung, of course! ); the psalm rendered in four-part Anglican chant; David Burtt’s English plainsong propers (psalm-tone based settings of the introit, gradual, offertory and communion antiphons), and an English translation of Credo III. 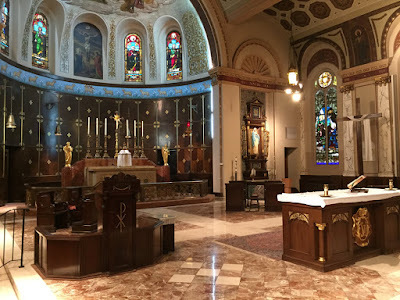 The Mass will be fully sung, including the responses, lessons, collects, etc., be celebrated ad orientem, with Communion received kneeling and on the tongue, the Sprinkling Rite at the beginning and the Last Gospel at the end. Of course, there will be no lay Eucharistic ministers, and the altar servers, crucifer and thurifer will all be men. We love these and other Tridentine inflections, especially the Ordinariate’s requirement of the use of the Roman Canon at all High Masses. The liturgy must be good, true and beautiful, because the God we worship is good, true and beautiful; our Fellowship greatly appreciates the Elizabethan style of the Divine Worship Missal, in which the beauty of the English language is on full display. The King James Bible is one of the great English masterpieces, and together with the Book of Common Prayer, contributed enormously to the development of our literary tradition. We believe that this “heightened” form of English, which is different from our everyday vernacular, provides us with a sacral language (Latin still being our official sacred language) that is appropriate and fitting for the worship of God. Before the Council of Trent and the promulgation of the Roman Missal of 1570, the Mass took numerous forms; one of these was the English Use of Sarum, which, along with other pre-Reformation English liturgical elements, informs much of the Divine Worship Missal. In our post-Summorum Pontificum age, the Roman Rite takes on various forms, through the Ordinary and Extraordinary Forms, and now through the Divine Worship Form. Thus, we see the Divine Worship Mass as yet another local “use” of the same standardized Roman Rite of the universal One, Holy, Catholic and Apostolic Church. In Anglicanorum Coetibus, Pope Benedict XVI called the “liturgical, spiritual and pastoral traditions of the Anglican Communion... a precious gift nourishing the faith of the members of the Ordinariate and as a treasure to be shared” with the rest of the Church. We plan to do exactly this. We can be reached at OrdinariateCT@gmail.com, and our Facebook group can be found at: https://www.facebook.com/groups/1782111635137581/. Please keep us in your prayers, and may God bless you.